This story is about Alex Mason, after failing catching Raul Menendez he landed in Equestria to save the the humans future. Ponyville has a new protector, but nopony knows what it is. It lives in the Everfree Forest and makes itself known when it kills a monster. Many think it's just superstition, others think it's a real creature. In truth, it's a human with a rifle. Sweetie Belle and Applebloom are no strangers to love, even if they're only twelve. So when they see that their big sisters need a little push in the right direction, they're more than glad to help. A human is sent to Equestria during a storm when he hides out in a barn. A pegasus wakes up in a morgue and can't remember who he is. For reasons unexplained, the Six are at a bar in Manehatten. They talk about mistakes, about love and lust, about stuff. Then some other ponies and humans eavesdrop on them and make their own comments. Kyle thought he was never going to see the ponies again... Well, he was wrong. VERY wrong. 3729022 Uh, a self insert love story? Uh no. the inspiration for this story came from the song The Traveling Soldier. Besides, it's a just a romance story. Don't take it so seriously. 3729032 Thank you! Sadly, everyone else is just forming an opinion without reading it. I couldn't really read it. You need whitespace between each paragraph or it turns into one massive wall of text. I'll put it into my read later pile and read it once it's edited. 3729044 Okay thanks. I did edit it as best as I could. 3729062 I also think part of the reason is because I did come out as a furry and this one guy below me accused it of being a "self insert" love story. I've gotten quite some backlash just because furries play a role in one of my stories. 3729022 I'm for constructive criticism but comments like that are unacceptable! 3729149 Yep. I sometimes post my stories on furry sites but sadly they almost never get viewed. Probably because they are non pornographic. 3729134 Thanks. Glad to see some people can appreciate a simple love story. Sorry, I had to post again upon reading it for the second time. “Man today’s applebuck’s harvest sure was excellent!” Applejack exclaimed with excitement as she carried her saddle sacks full of her juicy sweet apples and bags of her Granny Smith’s famous home cooked apple pastries. The sacks were filled to the brim with bright shiny apples freshly bucked from the farm. Golden delicious, granny smith, red delicious, and many different types were shining and just waiting to be sold. The two paragraphs are seperate because they have two seperate subjects. The first is describing the apples in the sacks and the second is about applejack travelling to set up shop. Also there are multiple spelling errors throughout. I'd suggest at least using something like ms word to spell check. But if you don't want to, find an editor to check the work before publishing. I'll upvote because I like the premise. Good job there, man. Just a quick detail: remember AJ's accent. 3729474 Thanks. And I tried. 3729349 Okay thanks. I try my best to proofread and edit but that's always been a weakspot of mine. 3729496 It's okay. Here, take my like and fav. I haven't read a chapter yet, but I must say, this is the first time I've seen a description being made like this. You know what most would say, 'first impression counts'. Give a bit more... "juicy" stuff, and I will bet it will attract more readers. 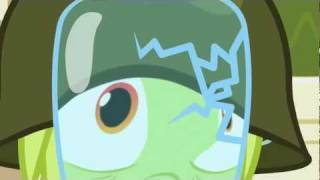 3733800 But Granny Smith and the sweetest elderly pony in Ponyville! She's only crazy around zap apple harvest season. 3735044 Btw, I found a human model for Ryan! He looks like this, only he doesn't have facial hair and his head is buzzed cut. Dude, I'm straight, and even I find that man attractive. in all honesty, i was just looking up random male models on google to help me get an idea of what Ryan looked like. 3746504 So what do you think of the new chapter? HUMAN ARE TREATED SO BAD FOR THE PONIES ARE ONLY A FEW O?? CELESTIA THE HATE (JUST CURIOUS)?? HAVE GOOD DIPLOMATIC RELATIONS WITH HUMAN AND CONTINENT Equestria??? 3762951 Well yeah that does happen. Just because two companies have good diplomatic relations doesn't mean the citizens themselves like each other. 3841578 Agreed on what? And thank you. 3851676 She's not stupid, she just has feelings for Ryan and has conflicting emotions about them.